No Doubt OnePlus one is the best android smartphone packed with lots of features and awesome specs. If you are the owner of the phone and updated your phone with some Custom ROM or faceing some prob;em with the phone like stuck in bootloop or bricked the device, here is the guide which will help you to restore the Caynogenmod stock firmware on your phone. Few days back we showed you How to Fix Bricked or Dead OnePlus One Easily, so now again we came with the new guide. In this guide we’ll use the OnePlusRecovery Tool, which allows you to restore stock firmware and fixed the bricked device. This tutorial is about the people who have bricked their phone, or want to revert back to stock. Follow this simple guide to unbrick your OnePlus One. Before following this guide install the OnePlus one drivers on your PC. Step 1. 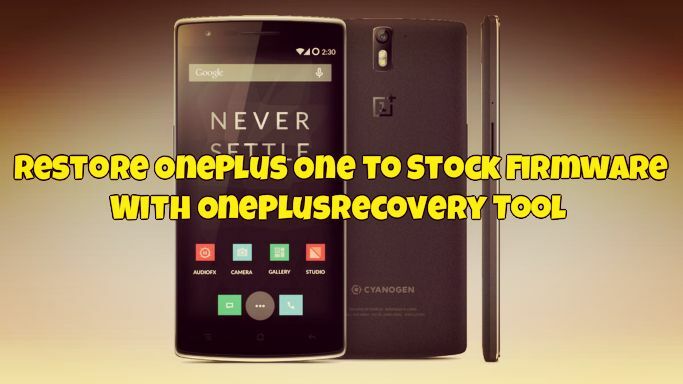 Download the OnePlusRecovery Tool from the below mention links on your windows PC. Step 2. Run the following program as an administrator, right click on the program, select ‘Run as administrator’ and proceed. Step 3. Connect you Phone to the PC. Step 5. Click Refresh, you will notice something different. Step 6. Make sure that ‘Normal Restore’ is checked, and click on start. The flashing process will start now. Do not interrupt the flashing process. It may take a long time. Step 7. Once the process is done on your phone and PC, it will show a green, at this point you may disconnect the phone from the PC. That’s it! Now your OnePlus one is fully restored on Stock Firmware. I have face problem in this restore tool. The problem is after using this tool i can’t install big size gapps showing some space issue in system partition.and i can’t install multirom after this using recovery tool. please tell me what happning ,what is the error.